For some reason, I had a terrible time finding peppermints. In December. How is that even possible? They are red and white! I finally found a small bag at the dollar store. I got one bag of red and white peppermint and another bag of green and white spearmint candies. Just line a cooking tray (I used a pizza round, but in retrospect I would use a shaped tray like a cookie sheet to avoid spillage) with parchment paper and bake for 8-10 minutes at 350°. The candies melt together beautifully. Allow to cool fully and then remove from paper. Be careful, it’s fragile, especially around the edges. 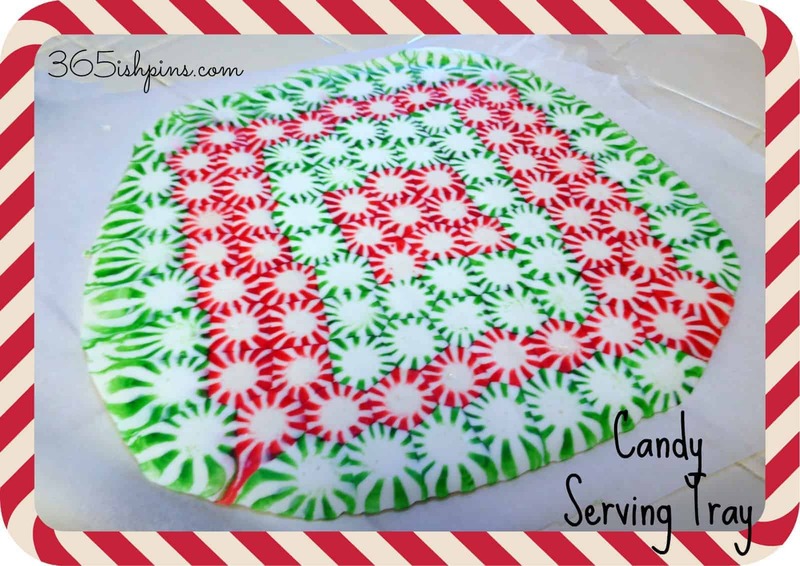 Serve goodies on your pretty tray and then break it apart and put it in a candy jar when you’re done! Pretty cool!